Baking cupcakes are incredibly fun especially when you yourself love to eat this cute dessert. But what more if you use cute cupcake molds to make them? And use healthy ingredients to make them taste sweeter and tastier? In here, you are about to find some of the best cupcake molds available in Amazon as well as some essential tips to bake a healthy and delicious cupcake for dessert. If you plan to bake vegan chocolate-based cupcakes, use the silicone cupcake molds from LetGoShop. Since chocolate-based cupcakes might stick especially if you use pans to bake them, these non-stick molds are perfect to handle these cute cakes. 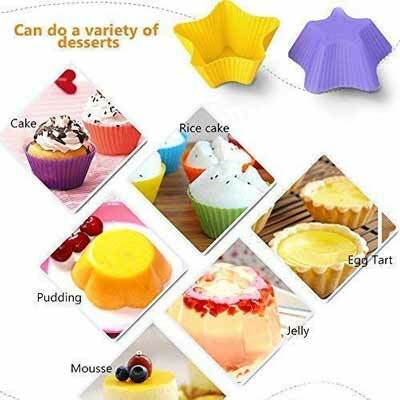 Aside from that, LetGoShop silicon cupcake molds have premium quality. Each of these molds is made of pure food-grade silicone that is FDA approved and BPA free. Moreover, these are non-toxic, eco-friendly, and you can use them a lot of times due to their high durability. When cooking chocolate-based cupcakes, you need to heat the oven for up to 160°C which is not a problem for this quality cupcake molds. It is safe from -40℃ to +230℃ and it is great for baking muffins, eggs, and utilize it for other purposes such as egg tart mold, pudding mold, and so on. For baking chocolate cupcakes, you might also use NuNaturals Organic Cocoa. It easily dissolves and blends on both hot and cold desserts and beverages. If you want to get a little more creative in baking your healthy cupcakes, the 3D silicone cupcake molds of R Recomfit will fit you better. It is made of 100% silicone and is dishwasher safe. Plus, it is heat resistant that can withstand from -40 to 445°F. You can use it for multiple purposes including candy making, wax, ice cube, soap, candle, and more. The fun in baking cupcakes is not only in putting colorful and sweet toppings on them or topping them with fluffy icing and cream. But for the most part, the beauty of their perfectly molded base is one that is mostly enjoyed. Like so, baking cupcakes will be very appreciated especially if you put only the best and healthy ingredients that can boost the health of those who eat. If you agree to this, I bet you’ll love adding Organic Green Banana Flour from NuNaturals on your next set of cupcakes. This is a product from healthy green bananas cultivated and also harvested in Ecuador. During the process of making this healthy cupcake ingredient bananas are milled and dried in order to make a tasty four that can be added to smoothies and baked products. You don’t need to put sugar when using this organic flour in baking because it is already sweet on its own yet it is grain and gluten free. It does not also contain sugar and it is low-carb and low-calorie which makes it perfect for individuals who are sticking on a strict diet. When using silicone cupcake molds to cook healthy desserts. Always make sure to choose the FDA approved and BPA free products. But along with this, you must also keep in mind to include only healthy ingredients on the cupcakes to keep a happy smile on the faces of those who will eat them.